What is the best thing you can do with some overripe bananas? A banana-milk-mix. And what is the best thing you can do with some overripe bananas at the end of a long, hot day? Add some ice cubes and make a banana shake. That was just what I needed right now. This block, for instance, looks harder than it actually was. But: I did it again! 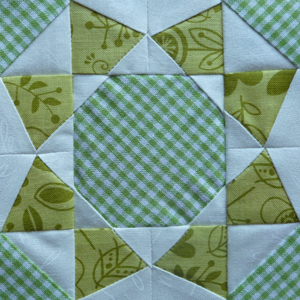 A block all in green, no turquoise. I didn’t mean to! It’s the new fabric’s fault. I simply had to include the green/white plaid. Bought a scrap piece for 1 Euro. I couldn’t help it. What? Buying it, or including it right in the next block that came my way. Both, of course! I am very happy with the result. Posted in Uncategorized and tagged farmer's wife, farmer’s wife quilt, peaceful hours, peaceful hours block, quilt, quilt block. Bookmark the permalink.